All information presented herein is believed to be true and correct at the time of publication, with the exception of articles, polls, text, photographs, and any visual, auditory, or other sensory content. 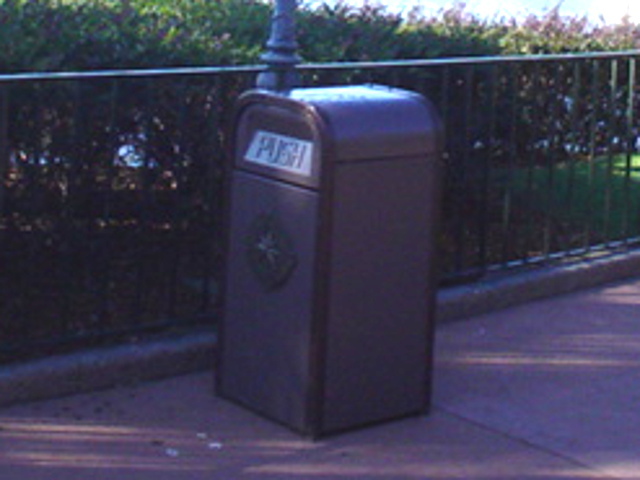 Content appearing on Uncle Walt’s Insider has not been evaluated by the United States Food and Drug Administration. 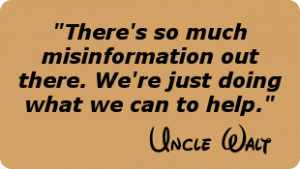 Uncle Walt is not a doctor, and this website should not be used to diagnose or treat any medical condition. Uncle Walt’s Insider is not affiliated with The Disney Company or any other corporation or legal entity; they don’t even return our calls. Not to be taken internally. No warranty, express or implied, is made as to the content of this website, and any reliance on it is at the user’s own personal risk. All events, persons, and companies depicted herein, including Disney, are fictitious, and any similarity to actual persons, living, dead or otherwise, or to actual firms, is coincidental. Really. The same goes for any similarities to actual facts. No compensation or other remuneration has been provided to Uncle Walt’s Insider by any person quoted or featured on this website, not that we’d be opposed to that. Please tip your waitresses. This website may not be reproduced, except with the prior written consent of the Commissioner of Baseball. Past performance is not indicator of future results. If redness or itching persists, consult a physician. Discontinue use if rash appears. Void where prohibited. TL;DR – we have no idea what we’re doing.